Meshing is a tedious, time-consuming, and sometimes mind-numbing process. It also is an essential and necessary component in the production of accurate computational fluid dynamics (CFD) solutions. Automating this process has been a decades-long goal with significant challenges: General automated meshers must sacrifice the quality of the mesh and, while they can produce high-quality meshes, specialized automatic meshers can only be used on a very narrow class of problems. Now, the latest version of Pointwise software and a collection of Glyph scripts is making it possible for users to automatically generate high-quality meshes for any geometry. The solution substantially reduces both the meshing time and the time required for manual input. Watching a three-toed sloth doing the back stroke through a lake of molasses is kind of like meshing . . . It seems to take forever. Several Pointwise users have been generating meshes automatically with Pointwise and a Glyph script package named GeomToMesh. The geometry is created using Engineering Sketch Pad (ESP), developed by Bob Haimes at MIT and Dr. John Dannenhoffer at Syracuse University. Working with ESP on a sub-contract for the U.S. Air Force, Pointwise created the Glyph scripts to enabled automatic unstructured mesh generation from water-tight geometry. The scripts can automatically create a volume mesh for geometry input in one of four formats: IGES (Initial Graphics Exchange Specification), STEP (Standard for the Exchange of Product Data), EGADS (Electronic Geometry Aircraft Design System), or NMB (Non-Manifold Boundary Representation). If the geometry is fully closed and water-tight, then a volume mesh is constructed. If the geometry is not closed, then just the surfaces are meshed, but that also saves the user a great deal of time according to Dr. Karman. If the geometry is in EGADS or NMB formats, then the meshing process in Pointwise is guided by the attributed information to construct a mesh more aligned with the user’s intent. One workshop scenario was a mesh parametric study of a notional commercial transport aircraft using files generated by ESP. Above are the results with meshing times and data sizes. The geometry files were attributed with boundary names and a specified wall spacing of 1.0e-04. 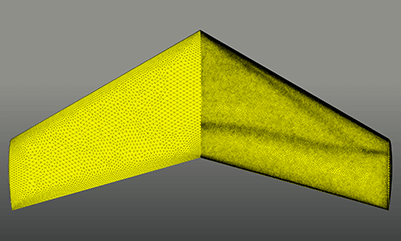 Another advantage that automation has over manual input, according to Dr. Karman, is that best practices can be applied consistently throughout the meshing process, which helps ensure a high-quality mesh. Dr. Karman adds that this is just the beginning for automated meshing. Work in the near future will include more testing and documentation, and his team expects the capability to evolve as necessary to support things such as high order mesh curving, solution-based adaptation and design. This project was commissioned by the U.S. Air Force under a subcontract from Bob Haimes, the principal investigator of the AFRL CAPS program, in order to allow Pointwise to automatically generate meshes for geometries created in ESP." Meshing is a tedious, time-consuming, and sometimes mind-numbing process. However, it is a critical, necessary component of accurate CFD solutions. Automating this process has long been a goal with significant challenges: general automated meshers sacrifice quality, and while they can produce high-quality meshes, specialized automatic meshers can only be used on a very narrow class of problems. 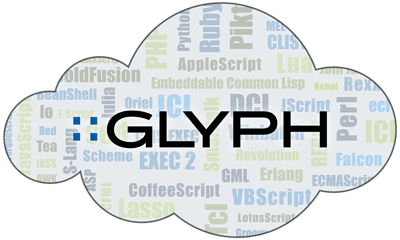 Integrating custom Glyph scripts enables Pointwise to automatically generate high-quality meshes for any Engineering Sketch Pad (ESP) created geometry. 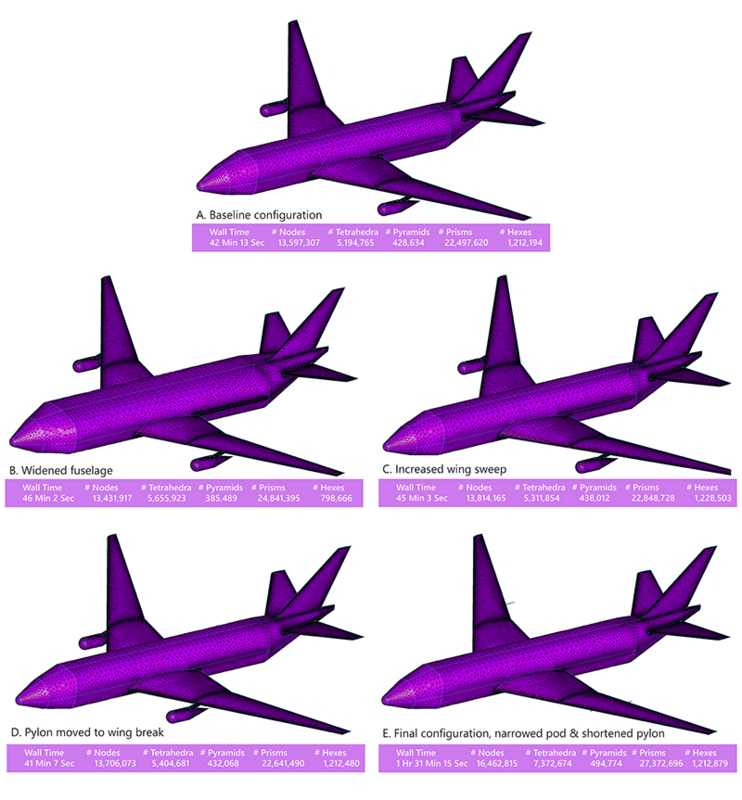 For a typical aircraft geometry, Glyph scripts integrated with the latest version of Pointwise can reduce meshing time from up to 15 hours to one or two, and time spent on manual input from 12 hours to a few minutes. Automation also ensures a more consistent application of best practices for higher quality results. 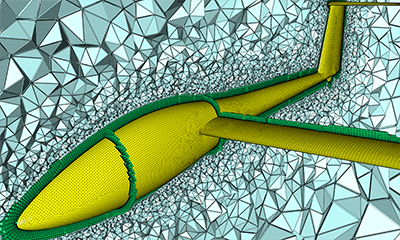 In this webinar, we highlight four new major features available in Pointwise V18: quad-dominant surface meshing, farfield shape creation, unstructured hex-dominant boundary layer meshing, and volumetric sources.